ZOOM ‘N’ BOOM Experience coming to Belfast and Glasgow next! Excited about the summer holidays? Looking for something totally cool to do? Then check out your nearest free ZOOM ‘N’ BOOM event! This summer, you’ll get the chance to become the ultimate driver with Hot Wheels and test out your blasting skills with BOOMco! The ZOOM ‘N’ BOOM experience is heading to five leading shopping centres and you can test out the latest kit Hot Wheels and BOOMco have to offer! With Hot Wheels, you can jump in the driver’s seat and race cars on their awesome Track Builder Systems! Try out some daring stunts or challenge your friends to see who is the ultimate track master! You can also have a blast with BOOMco and the cool new air-powered BOOMco blasters! Have a go at hitting the target with the colourful and super-sticky Smart Stick darts that let you see exactly where you nailed the shot! Plus, you can also try on some fun props and get your photo taken so you can show off to all your mates when you get back to school! So far the experience has visited Essex, Milton Keynes and Manchester and we sent our Fun Kids Expert, James, to check it out. ZOOM ‘N’ BOOM is now heading over to Belfast in Northern Ireland and Glasgow in Scotland for the final legs of the tour! If you’ve not seen it yet then make sure you don’t miss out! 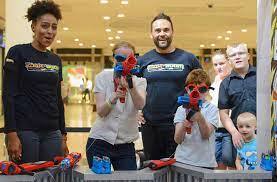 ZOOM ‘N’ BOOM heads to Castle Court, Belfast from 20th – 24th August and Braehead, Glasgow from 27th – 31st August! Have you checked out the ZOOM ‘N’ BOOM Experience? Let us know in the comments below.